El Malecon (also known as Avenida George Washington) is also home to one of Santo Domingo’s iconic monuments, El Obelisco. Built in 1936 to commemorate the city’s rechristening as Cuidad Trujillo by the brutal and egotistical president of the county, Rafael Trujillo, El Obelisco is visible for much of El Malecon’s stretch. It is now adorned with Dominican flags and distinctly anti-Trujillo murals. El Obelisco is seen as monument to the resistance against this despot and those who suffered under his rule. It honors the famous Mirabal sisters, anti-dictator campaigners who were persecuted by the despot. Three of the four beautiful women, symbols of Dominican resistance, were assasinated in 1960. Their life is immortalized in the fictional account by Dominican-American author Julia Alvarez, In the Time of Butterflies. Further down El Malecon stand the smaller two Oblisca towers, also built by Trujillo. 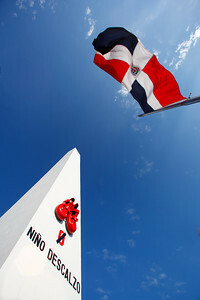 El Obelisco adorned with Dominican flags. The obelisk stands in honor of those who suffered under the brutal rule of Trujillo.